Seals were used to make a sealing, or positive imprint, like this modern resin one made from the original seal. Sealings were used in ancient times for trade. They would be made on ceramics or the clay tags used to seal the rope around bundles of goods. Ancient Mesopotamian seals from the same period functioned in this manner. Numerous Indus seals have been found in ancient Mesopotamian cities. 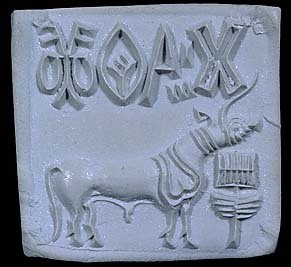 There is evidence for settlements of Indus valley traders in ancient Mesopotamia, in the form of Mesopotamian seals with Indus language characters. The letters above may designate someone's name or class. The final pictograph (there is agreement from manufacturing evidence that seals were read from right to left) is related to a possible class of three common endings. They feature the sign of someone carrying goods, possibly indicating a trading group or caste.